Rangers legends David Weir and Ronnie Mackinnon with a lucky fan, who secured some of the Rangers' memorabilia which was up for raffle. Former Rangers Captain David Weir was the latest light blue legend to visit The Lewis and Harris Rangers Supporters Club as he attended the club last weekend for a special question and answer event. 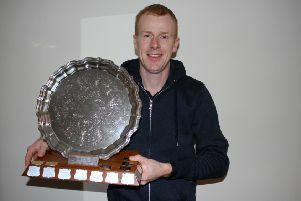 David was the last team skipper to lift the league trophy for the Ibrox side in 2011 and despite joining them late in his career, he won an incredible three League titles, two Scottish Cups, three League Cups and he was a central figure in the side which stormed to within 90-minutes of European glory as he played in the 2008 UEFA Cup Final during his five year stint in Govan. Weir also won 69 International Caps during his career making him Scotland’s seventh most capped player of all time. Weir travelled North on Friday, November 16th, to meet members of what has been recognised by the club as the world’s biggest Rangers Supporters Club in Stornoway. 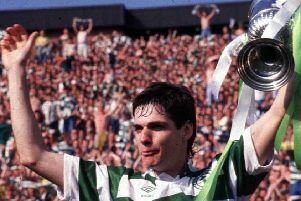 Along with local Rangers legend, Ronnie MacKinnon, he headed to the Inaclete Road club house that evening and the pair took to the stage at 8pm to begin the session. David spoke with great passion, honesty and wit about his career in football and told the eager crowd about how he eventually ended up at the club he had supported his whole life, at the age of 36. He went on to speak about the amazing 2008 UEFA Cup run in which Rangers reached the Manchester final, as well as some of the famous last day title deciders and cup finals he played in, his International career and his 18 months as assistant Manager at Ibrox. Following the main part of the packed out question and answer session, there was a short break before David took to the stage again for a few more questions. He and Ronnie then drew the raffle, which gave the Rangers fans a chance to get their hands on some fantastic Rangers memorabilia. Weir closed the main part of the evening with a word of thanks to the members and committee of the Lewis and Harris RSC for the warm welcome and great hospitality he received. He stayed at the Club House for another couple of hours for pictures and to chat with the fans informally before calling it a night and heading back to the mainland on Saturday morning for another Rangers Supporters event in Blackpool that evening.